Twenty-seven Hamilton Scholars graduated from college this spring, equipped with degrees ranging from Russian Language to Neuroscience and tools to change the world. 85 percent of the 2012 Scholars who entered the program five years ago have remained active, with a 100 percent retention rate for first-generation college students. While the national six-year college graduation rate is 59 percent, the Pell Institute reports that 10.9 percent of low-income, first-generation college students graduate from college within six years. At AHS, 90 percent of retained 2012 Scholars and 86 percent of first-generation 2012 Scholars graduated from college within four years. As college graduates, these Scholars now enter the role of Hambassador. Whether through becoming donors, sharing their time, energy, and expertise, spreading the word about AHS in their communities, or participating in fundraising efforts, we encourage alumni to give back to the organization in ways that are most meaningful to them. Because of you, these Scholars have traveled to Seattle, Washington and Tecpán, Guatemala for transformative leader weeks dedicated to the college transition and leadership and service. Your contributions to the Independent Internship Scholarship and Texas Leader Weekend have supported career readiness and transition for our Scholars. 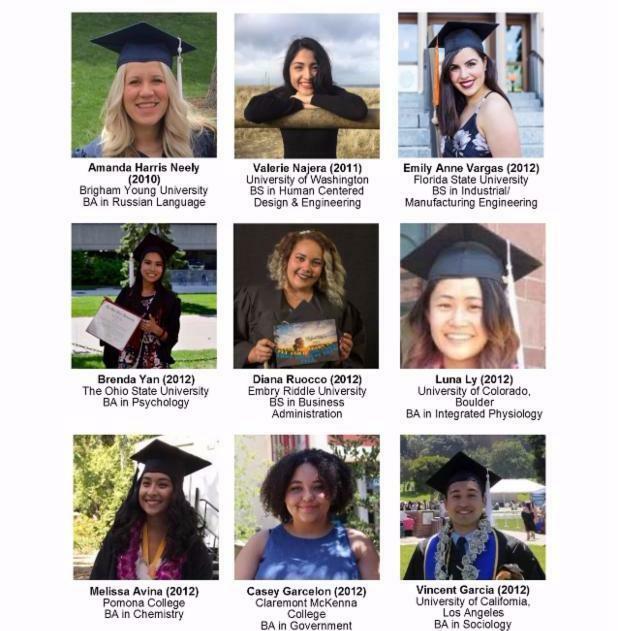 Your impact shines in each of these graduates. Thank you.